Building an online ecommerce store in 2017 has never been easier with either Shopify or Bigcommerce. Choosing between these two major platforms can be difficult, since they seem so similar. Which one is better? To answer that question, we’ve compared nearly every aspect of both stores. Read on to find out! Without further ado, let’s compare! Design is extremely important. It’s the first thing people will see when they come to your storefront and it needs to be professional and meet the needs of your customers to build trust. After all, without trust, you won’t be making sales any time soon. Check out any major retailer and you will see their attention to detail in their layouts, product photos and overall theme. Building a beautiful storefront needs to be easy and accessible. 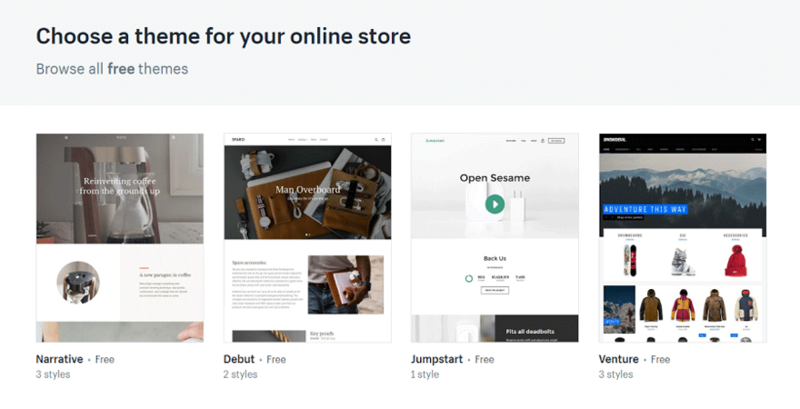 Thankfully, Shopify and Bigcommerce both provide free and premium themes so you can pick the perfect look for your store. Let’s take a look at each platform’s free themes to see how they differ. Shopify provides 9 free themes while Bigcommerce only has 7. Each of their themes have several different styles to choose from. All of Shopify’s themes have been made by professional independent designers, so each has their own feel, easily making your store look professional and credible. 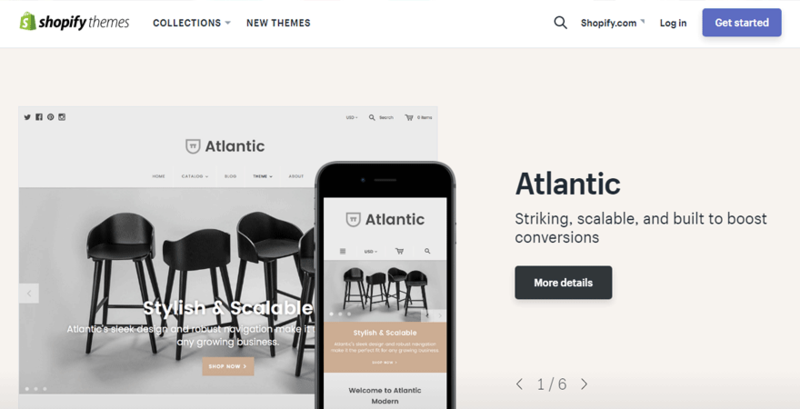 Shopify’s free themes suit any variety of business. Whether you are selling one product or 1000, there’s a free theme which will be able to meet your demands. On the other hand, Bigcommerce’s themes are more similar to each other and don’t have the individual, distinct quality that Shopify’s have. Ultimately, you can create a professional looking shop on either platform with the free themes. You will just have more options with Shopify. Bear in mind, however, that a theme only provides structure for your store. You still have to populate it with high quality product photos and descriptions in order to draw attention. The Shopify Theme Store now has over 100+ themes ranging in price from $140 to $180. Bigcommerce’s Theme Store has around 80, starting at $145 and topping out at $235. As stated before, each Shopify theme is created by a different independent designer, giving each a different unique look. They are constantly releasing new designs so you can easily find a modern stylish look for your store. Bigcommerce’s themes have names like Fortune Minimal, Fortune Contrast, Fortune Bright, etc., where the only changes are different colors and layouts. These differing variations on a theme do have their own look and feel, but there is overall just less choice. Comparing the two, Shopify comes out on top in the paid theme category for its diverse collection. You can also check out this massive list of the most successful online stores built on Shopify. Both Shopify and Bigcommerce allow you to edit their themes with either their content management system or by directly editing the HTML and CSS. This level of customization gives you the ability to design your shop exactly the way you want it. Shopify uses a design language called Liquid. It directly ties into your store’s database and dynamically updates information based on product tags, descriptions or any other information kept in your database. While this is great for those who aren’t coding their own site (the majority of online retailers), if you’re looking to custom code your site or hire an expert, it can be difficult and/or expensive. 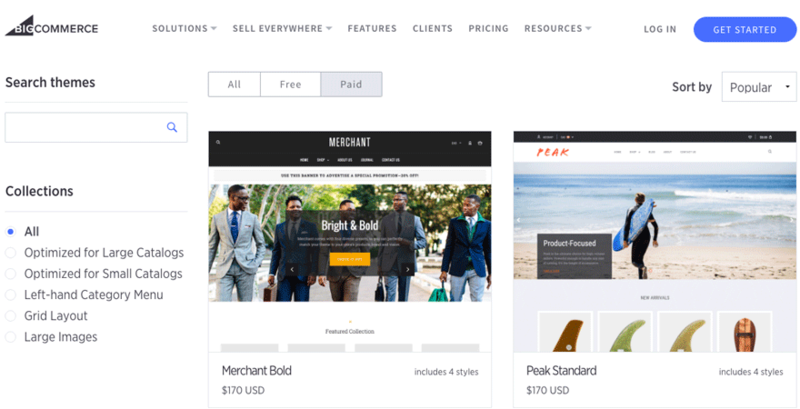 BigCommerce, on the other hand, uses a stencil theme editor. You can custom-code their themes even if you just know HTML and CSS - they don’t use a custom language. You can also hire an expert to code your store, and it won’t be quite as expensive. The biggest differences between the two standard plans on both platforms are in the eCommerce tools provided. 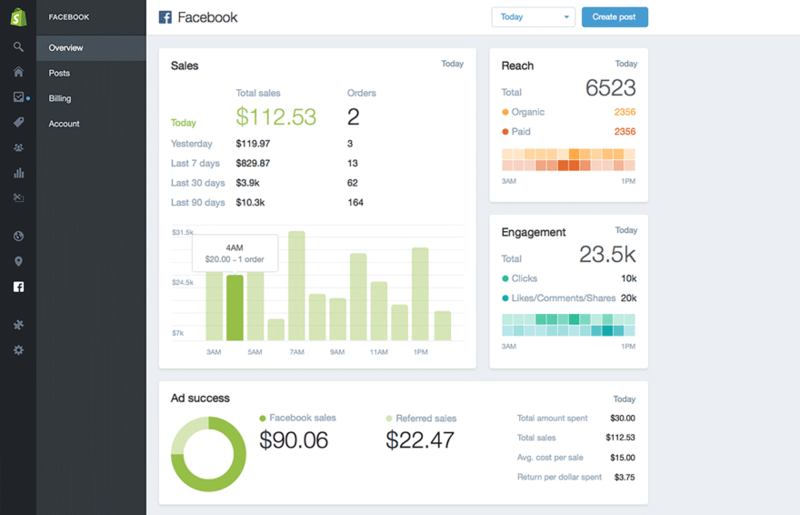 Both Shopify and Bigcommerce offer a wide variety of tools to analyze and create reports. Each platform provides information on customer data and acquisition, new vs returning customers, search reports, accounting and financial data, and on what products are most popular and get the most views. If you are using “Shopify Plus” or “Advanced Shopify” then you also get access to Shopify’s custom reports using any metric you want. You can get information about abandoned carts, inbound statistics, viewing habits, etc..
Bigcommerce offers all of the above as well, but offers it in their standard plan. It’s one of the biggest features of why you would want to choose BigCommerce over Shopify. Additionally, both platforms allow for easy installation of Google Analytics. Another big feature on both platforms is their abandoned cart functionality, which allows you to set up an automated email to be sent to those people who got to checkout, but didn’t purchase. According to Baymard Institute, a web research company in the UK, 67.45% of online shopping carts are abandoned. So having a way to get these people back is paramount to your store’s success. Bigcommerce’s functionality, which the company says recovers 15% of lost sales, is much better designed than Shopify’s version. Bigcommerce allows you to send up to three emails to people who abandoned their cart, while Shopify only allows one. Outside of these times, the person has probably forgotten about your store and you don’t want to come off as spammy. So it’s best to follow Shopify’s advice and send the email 1 to 10 hours later. Both Shopify and Bigcommerce have similar levels of customer support. They both offer phone, live chat, active forums and email. Both services have 24/7 phone support, however for Bigcommerce you have to jump through some hoops and fill out a form before you can contact someone on the phone. Shopify’s details are on the site and easy to find. Plus, they even tell you how long you’ll have to wait before someone will help you. 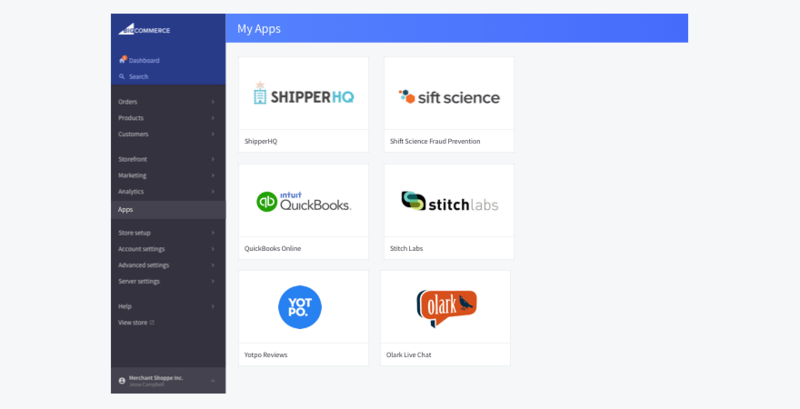 Both Bigcommerce and Shopify do more than just show off your products and process payments, they also have a wealth of third party apps to choose from. Shopify alone has over 1,700 different apps which can be added onto their platform covering all ranges of your business process from marketing, inventory, social media engagement, accounting etc. If you have an extra need, there’s an app for it. While there are many free apps in the Shopify store, most have a monthly fee, which can range from $0.99 to $200+ per month for some of the more intensive and expensive apps. However, the benefits provided by them are enormous. The Shopify app store is really one of the greatest benefits of using the platform, as every single app easily integrates, you never have to worry about updating or making sure you have the correct version, and installing them is extremely easy. On the downside, the price of these apps can add up. If you use just 5 apps, this could easily cost more than $100 to $200 a month. For smaller stores and for those just starting out, this could have a big impact on your bottom line. Bigcommerce’s app store works the same as Shopify. There are hundreds of apps that integrate seamlessly into their platform to assist you in CRM, marketing, increasing conversions and taking care of other manual processes. Bigcommerce has less to offer in their app store, but this is because they offer a bit more functionality for their basic plan. In this day and age, SEO is incredibly important to your store’s success. Ranking on Google’s front page can bring you more high-converting traffic than nearly any other marketing channel. Luckily, both Shopify and Bigcommerce are SEO friendly. You have access to change all of the meta tags and image alt tags, edit all of the descriptions to your liking, and set up robots.txt to whatever your site needs. However, it’s always best to work with an SEO specialist if you don’t know what you’re doing. Pro Tip: If you want to get serious about SEO for your online store, consider investing time in an eCommerce content marketing strategy. It’s one of the most effective ways to grow a site’s traffic and increase sales. Lastly, there are many apps available to help increase SEO effectiveness in both app stores. To start, let’s list out all of the pricing plans for both platforms. The most basic comparison between the two platforms can be made between the “Shopify Basic” plan ($29 a month) and the “Bigcommerce Standard” plan ($29.95 a month). The rating and review system can be added for free in Shopify, but you do have to install a third-party app and then add some code to your store's system files. The Basic Shopify plan is miles ahead of Bigcommerce when it comes to one thing… money! Bigcommerce only allows 50k worth of sales per year before they force you to upgrade to their more expensive versions. Shopify has no such limit. Both Bigcommerce and Shopify charge 0% for transactions fees, however, you have to use Stripe with Shopify to qualify for those rates. Additionally, both Shopify and Bigcommerce allow you to use a wide variety of other payment gateways if you do not want to use Stripe or Braintree. They support all of the major ones like Worldpay, Quickbooks, Paypal, 2Checkout, etc. Shopify supports 70 different gateways, while Bigcommerce only offers access to 40. For most users, a third party gateway is going to involve extra fees and more hassle, so it's easy just to use what Shopify and Bigcommerce provide. All in all, when it comes to opening an online store, you really can’t go wrong with either platform. Shopify has a better theme selection, a larger choice of custom-built apps, and a built-in blog. BigCommerce has a more easily customizable backend code system, some slightly better options at the standard price level, and slightly better built-in abandoned cart emails. Shopify is the more popular choice at the moment, but BigCommerce is no slouch either. It’s too bad Amazon Webstore isn’t still around to keep competition (and innovation) up! Which platform will you choose? Let us know which and why in the comments below! Related article: Shopify vs Woocommerce: Which is better? I read that SaleHoo helps when starting in Shopify ? Is that correct ? If you start a shop, wouldn't it be partly about traffic ? Traffic is definitely a major concern for an online store. Fortunately there are a lot of great ways to market yourself, including social media. However, other factors like what payment methods you can accept, the overhead costs, store feature, and ease of use. Running your online store will be difficult if you hate the platform you're using or it's difficult to upload information about products. So traffic is just part of the picture. Shopifys most popular plan is 29 per month, not 79 and their file store is unlimited as well. You definitely should have done more research before writing this. I'm trying to figure out which platform to use and it's articles like this that throw people off. We apologize for any confusion this has caused. @JustinGolschneider - why not keep the article truly updated then? Was searching to figure out which of the mentioned ecommerce solutions to go with, and this article misleadingly shows as " 1 day ago" on Google; tricking me to click to read. Totally misleading! It is completely useless and a waste of precious time for an outdated article to be ranking 1st on Google. Will be filing a report with the G web team about this. Hi Kennedy! The date Google is showing is the "dateModified" date, which is updated every time somebody comments. We supply Google with both dateModified and datePublished, and the latter has remained 2014-07-02 10:45:00. With nearly 600 blog posts in our archives, it's impossible for us to keep all of our articles updated, but we do occasionally update some of the more popular ones. I'll let our content team know we're receiving requests for an update here. what about Prestashop ? Can anyone tell Prestashop is the best over the the others mentioned above ? I'm not very familiar with Prestashop is a free shopping cart platform that helps small to large businesses build and run a successful online store. Since I have not used it personally it would be difficult to give you an accurate comparison. All the best! Sounds as though using Shopify for first time users is more beneficial for pricing, blogging and POS fees.